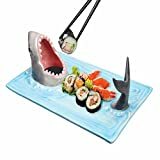 When you have a voracious appetite for sushi, then be sure to serve it up appropriately on this cool new Shark Attack Sushi Serving Platter. This terrifyingly fun ceramic serving platter has a hungry shark emerging from the murky depths to hold soy sauce or other dipping sauces in its gaping jaws, lets you serve sushi rolls or chips on the ocean blue middle, and its tail is there to hold up your chopsticks. Each platter is hand-painted and makes a fun way to serve guests during Shark Week or give it as a cool gift.